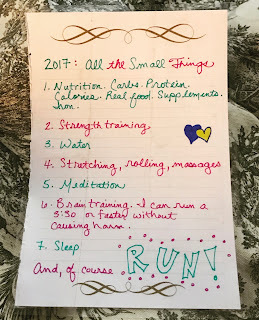 I finalized the details for the 2017 Glass City Marathon and Chicago Marathon, and this year it's about All the Small Things. 1. Nutrition. Eat enough to fuel the runs. Carbs and calories to fuel, protein to recover and maintain strong muscles. Real food. Iron and vit. D supplements. 2. Strength training so my muscles are strong enough to run a strong 26.2. 5. Meditation. Listen to the body. Tune in to the brain. Chill the you-know-what out. 6. Brain training. Brain Training for Runners (Matt Fitzgerald). I'm very much a science and data person. Teach my brain that I can run 26.2 miles in 3:30 or faster without disrupting homeostasis or causing harm. It's a real thing. I can reflect on times in my life where my brain consistently looked for the option that maintained comfort and avoided confrontation or discomfort. Time to retrain the brain. And, of course, RUN! 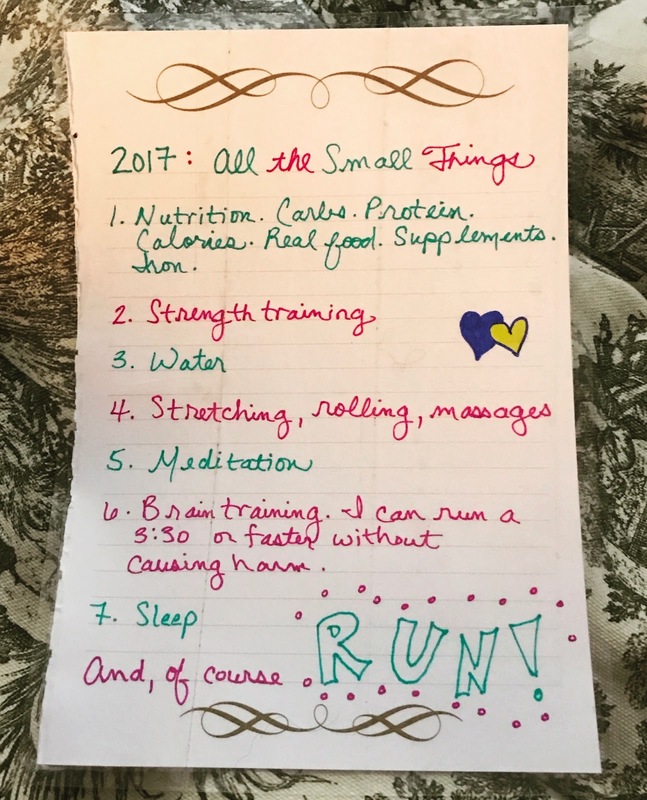 A great plan from my wonderful coach, Amanda, with a goal to increase my average weekly mileage a little from previous training cycles.